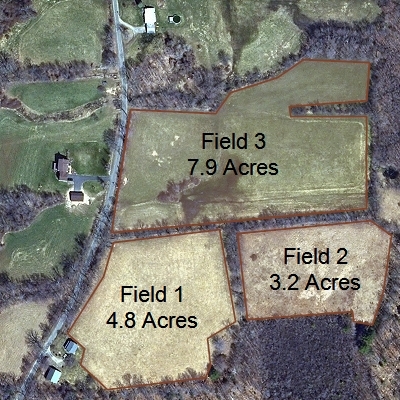 Accurately calculating the area of irregular parcels, fields, and other geographic features is an important task for real estate agents, foresters, and property owners. ExpertGPS mapping software makes it easy to calculate area, no matter how irregular the boundary. If you can walk the property with a GPS receiver, or trace it on a map or aerial photo, ExpertGPS can calculate the area, and display the results in acres, square feet, square miles, hectares, or square kilometers. Just a few clicks on the aerial photos in ExpertGPS was all that it took to trace these fields. ExpertGPS automatically calculates the area for any drawn object on the map, or for your recorded GPS tracklogs. Ask the GPS Expert: How do I calculate the area of a farm field? Timber companies use ExpertGPS to calculate the acreage of woodlots and to estimate harvest yields. Foresters can view their holdings on the aerial photo maps in ExpertGPS, and superimpose grids and draw routes prior to field work. Parcel and tract outlines can be sent to any handheld GPS prior to field work. After a timber cruise, you can retrieve the GPS tracklog from your Garmin or Magellan GPS receiver and plot your exact path through the forest on the maps in ExpertGPS. ExpertGPS accurately calculates the acreage of any closed figure you draw on the map, or walk with your GPS. Calculate field sizes using ExpertGPS to accurately determine fertilizer requirements and to estimate crop yield. Quickly map out fence lines and paddocks, and send a map of your fields right to your GPS. In the field, use your GPS to mark waypoints at locations that need spot treatments. Print out maps of your fields. Calculate the acreage of any lot or commercial parcel. Preview any site right from your computer - just enter the address, and ExpertGPS brings up the map. Determine property boundaries by entering the legal description (metes and bounds) into ExpertGPS. Print out parcel maps to distribute to clients. Whatever your job, if you work with land, GPS, or maps, ExpertGPS will save you time and money. Put ExpertGPS to work for you.